Karla Knight is a visual artist born in New York City and currently living and working in Connecticut. She received her BFA in painting from Rhode Island School of Design in 1980. Her work has been widely exhibited in numerous solo and group exhibitions, and she is represented in the collections of the Museum of Modern Art, the Brooklyn Museum, the Walker Art Center, and Emily Fisher Landau, among others. 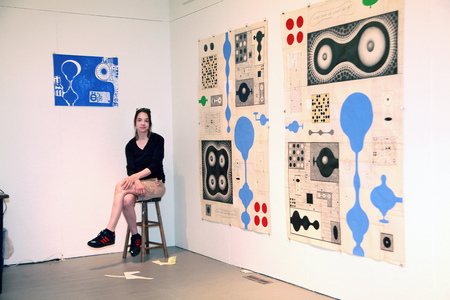 She has been the recipient of various awards and fellowships including The MacDowell Colony, Yaddo Corporation, and two Connecticut Artist Fellowships. Karla Knight's work consists of imaginary language, objects, diagrams, and symbols. It forms a pictorial language of symbol and writing whose underlying system is not known. Simultaneously ancient and futuristic, the work creates an alternative culture which plays with the mystery (and absurdity) of life, and what lies hidden underneath.